Sony Xperia Z is a bright, vibrant and expansive delight smartphone and one of the most visually impressive handsets on the market today, with the device’s expansive 5-inch Full HD display encased by a sleek, narrow bezel led design that screams of quality. The phone is waterproof, shatterproof as well as dust and scratch resistant with clean and stylish design. Sony Xperia Z price in India is around 28K - 30K hence buy Xperia Z at cheapest online price. 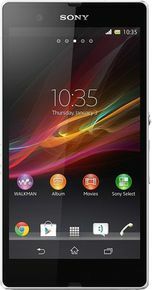 Xperia Z sports a 5-inch TFT display that has a resolution of 1080x1920 pixels and a pixel density of 441ppi. The screen is bright and vivid, and text looks extremely crisp while app icons and images look sharp. Sony Xperia Z is currently running the latest Android 4.4 Kit Kat operating system with 1.5 GHz quad core Krait processor and Adreno 320 GPU. It has 2 GB RAM and 16 GB internal storage which is expandable up to 64 GB using the microSD card slot present on the device. Xperia Z specifications includes 13 MP primary camera with features such as auto focus, LED flash, Geo tagging, touch focus, face detection and image stabilization. The camera can record full HD video at 30 frames per second with continuous autofocus, video light and video stabilizer. This device also features a 2 MP Exmor R front facing camera that is capable of recording 1080p videos. Buy online Sony Xperia that comes with a giant 2330 mAh battery that provide talk time of 11 hours on 3G and 14 hours on 2G networks. Sony also offers a STAMINA mode, which as per the company can improve the standby time by automatically shutting down battery-draining apps whenever the screen is off and starting them up again when the screen is back on. One of the selling points of the Sony Xperia Z is that it is also water resistant. So if you are planning to buy Sony Xperia Z online then compare online prices from many Indian stores like Amazon, Flipkart, and Snapdeal etc. and find the best online price. I am using this handset from last two years.i didn't found any big issue with it.the only problem which i faced is the issue related to battery and I know it's just a common issue. Amazing full hd display with 441 ppi. There is no doubt about the clarity of camera,it's amazing. Battery drains fast,when using Internet and while taking photos,and also while playing huge games and also it gets heated while doing the same.but it's all common for all the handset. So these all r not the big issue. 4. water proof some extant. 4. front camera is good as comparing to rear. 6. Faster draining of battery in 3G. 7. Back panel Heating issue. 8. 13.1 MP is totally fake. If i were to have this phone back in 2013. I would be awestruck. I have this device since February 2015. Still powerful enough to get through anything like a breeze. Easy to hold. Very sharp camera. Very sharp display. And i like the fact that the viewing angles are bad. 'Cause then no one else can view my screen. Only i can. Lol. Anyways the battery life used to be amazing but the Kitkat 4.4.2 - 4.4.4 updates ruined it's battery life. I searched quite a bit and it was the "Google Play Services" not going to sleep due to some Sony app maybe. Not quite sure but the battery life sucked to 5 hours with full 3g and music and browsing. That i would call heavy use .. Expected more out of this device. Anyways. After being one year and older the phone's rubber flaps which seal the earphone jacks and all leds come off. Making the phone unwaterproof now. But those are just the flaws. The advantages of having this babe is really too much .. It can outweigh the flaws of the design. Though i would recommend the Z2 or Z1 instead. Updates. Loads of them from Sony. Speaker placed on the bottom right side for noise not getting suppressed when in pockets or under some cover from pillows. Dunno rubber covers can last how long?